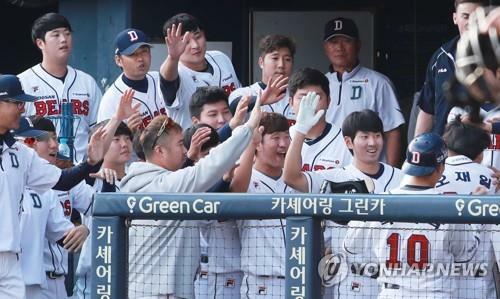 SEOUL, Sept. 25 (Yonhap) — The Doosan Bears clinched the best regular season record in South Korean baseball on Tuesday with a dominant victory at home. 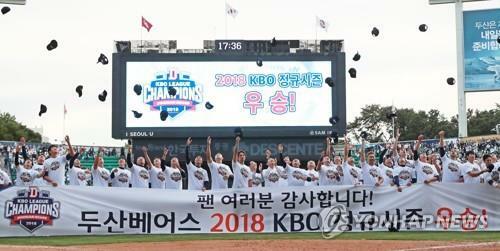 The Bears captured their third Korea Baseball Organization (KBO) pennant by blowing out the Nexen Heroes 13-2 at Jamsil Stadium in Seoul. The Bears improved to 86-46 and locked down first place in the 10-team league with 12 games remaining. By winning the pennant, the Bears also earned a bye straight to the Korean Series, the best-of-seven championship final in the KBO. The second-place SK Wyverns defeated the LG Twins 16-7 on Tuesday, but at 72-58-1 (wins-losses-ties), they are 13 games back of the Bears with 13 games left. The Wyverns also can’t catch the Bears in the win column. The Bears previously won the pennant in 1995 and 2016, and grabbed the Korean Series titles in both seasons as well. The Bears are looking for their third championship in four years. They won it all in 2015 and 2016, and finished runner-up to the Kia Tigers in 2017. The Bears climbed to the top on April 7 and have had sole possession of the lead for all but one day since then. They briefly shared the top spot with the SK Wyverns on April 28 and haven’t had company at the top since. Manager Kim Tae-hyung, who led the Bears to the 2016 championship, gave credit to his coaching staff and players. Kim said he never felt any pressure to win the pennant, knowing that he had an experienced group of players who played in the past three Korean Series. On Tuesday, the Bears gave up the first run of the game in the top of the first, but responded with three runs in the bottom half of the frame to take a 3-1 lead. The Heroes got one back in the top fifth, but then the Bears blew the game wide open with a six-run seventh inning to go up by 9-2. No. 7 hitter Oh Jae-il launched a grand slam to lead the outburst. The Bears added four more runs in the eighth inning to round out the scoring. Doosan starter Lee Yong-chan scattered seven hits over five innings and held the Heroes to two runs, improving to 14-3 for the season. Lee has the second-best winning percentage among qualified starters at .813, behind his teammate, Seth Frankoff, who has gone 18-3 in his first KBO season. The right-hander leads the KBO in victories. Second on the wins list is right-hander Josh Lindblom, who left another KBO club, the Lotte Giants, to sign with the Bears last winter. Lindblom has gone 15-4 and leads the KBO with a 2.88 ERA. Former starter Ham Deok-ju has thrived as the new closer, with 26 saves — second most in the KBO — and a 2.91 ERA. The Bears have also been getting it done with the KBO’s most lethal offense. Prior to Tuesday’s game, they were leading the KBO in batting average (.309), runs scored (854), hits (1,452), triples (30), total bases (2,306), slugging percentage (.490) and on-base percentage (.375). The Bears have posted these numbers with virtually no production from a pair of former major league hitters who came in with great expectations and left with little fanfare. The Bears opened the season with Jimmy Paredes, who’d been with five big league clubs over six seasons, but he was cut in June after batting only .138 with one home run and four RBIs in 21 games. Former Los Angeles Dodgers outfielder Scott Van Slyke replaced Paredes later in June, but he, too, was released earlier this month, having hit .128 with one home run and four RBIs in 12 games. During Tuesday’s game, Doosan’s cleanup hitter Kim Jae-hwan became the first KBO player to put up 30 home runs, 100 RBIs and 100 runs in three straight seasons. He scored his 100th run in the bottom of the first inning to enter the record books. He entered the contest with 43 home runs and 128 RBIs, both tops in the KBO. Kim is one of seven Doosan regulars batting over .300 this year. Oh Jae-il, who hit that seventh-inning grand slam Tuesday, had a sluggish start to the season and was batting only .215 at the end of June. After a two-hit effort in the pennant-clinching victory, Oh is now batting .280. Elsewhere in the lineup, infielder Choi Joo-hwan has enjoyed a breakout season at age 30. Choi is third on the club with 23 home runs, after hitting just 22 long balls in his 10 previous seasons. The long-time backup got his first regular gig in 2017 and responded by batting .301. In 2018, Choi has put together by far his best power season, while drawing walks and getting on base at a career-best rate as well. Backstop Yang Eui-ji, widely regarded as the KBO’s best two-way catcher, has had a typically excellent season behind the plate. At the dish, Yang was flirting with a .400 batting average into June before fading away, but is still hitting a robust .350, along with 21 home runs and 71 RBIs.